NOTE - There is no upgrade path from DD2-LITE to DD2-PRO+. Both are independent systems. The DD2-LITE display indicates real time information on all key vehicle parameters and is designed to replace all dashboard instrumentation with one compact, light-weight unit. 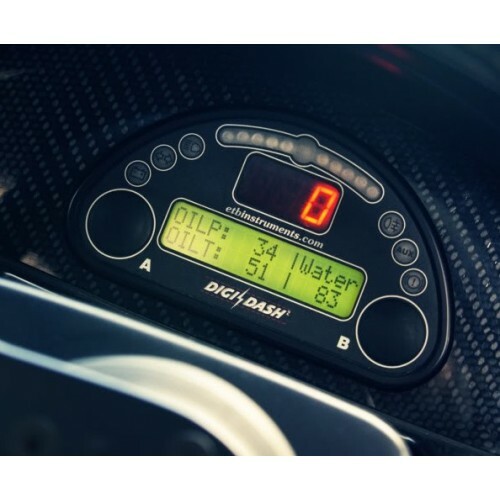 Primarily designed for road and track day use, the DD2-LITE displays the following parameters: speed; rpm; engaged gear; water temperature; oil temperature; oil pressure; battery volts and fuel level. 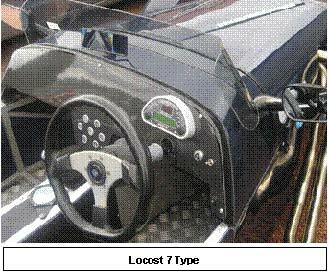 In addition, the system also includes: 11 programmable rpm shift lights; 5 key warning lights; 1 one configurable warning light; as well as peak value recall on all parameters; a road legal odometer; a trip distance counter / timer / average speed indicator and a real time clock that shows both time and date. Programmable alarms allow you to preset alarm levels and leave the task of monitoring temperatures and pressures to the DigiDash system, enabling you to get on with the job of driving the vehicle. An example selection of the displays available on the LCD Menu alone are shown below. In normal use these are selected and cycled through using Button A. Water Temperature, Oil Temperature and Oil Pressure are shown on this screen. 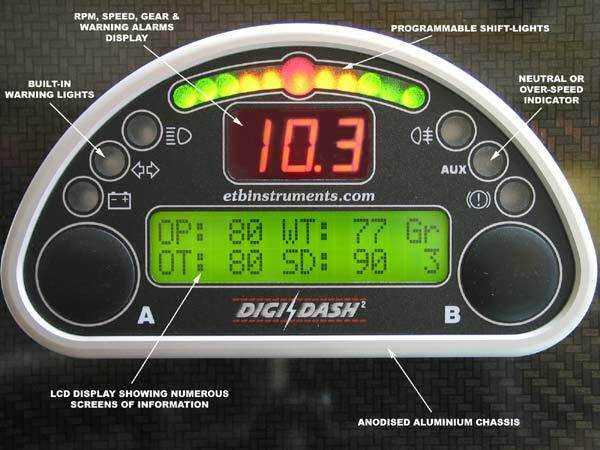 You can configure this LCD screen to also display Speed and Engaged Gear if desired (as shown in the above picture). The LITE has an Odometer (user selectable for Miles or kilometers), Battery Voltage and Fuel Tank Level (indicated as a % remaining in the fuel tank) as shown on this LCD screen. This screen shows RPM, Speed and Engaged Gear. The Gear indicator will show C for Clutch Down, N for Neutral (Bike engines), and 1st, 2nd ,3rd, 4th, 5th and 6th. 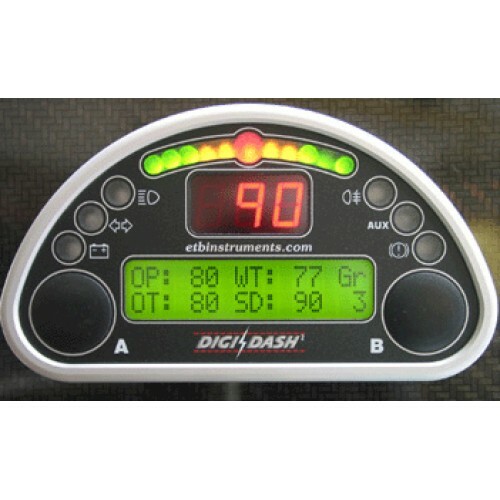 The DD2-LITE will store maximum recorded values for the following parameters: water temp; oil temp; oil pressure; speed; rpm and battery volts. These values are stored indefinitely until the user either manually resets them, or configures the DigiDash to reset all max hold values on power-up. The centre RED, 3-digit LED display shows the following parameters RPM, Speed, Gear and is the main display for the programmable warning alarms. The alarms will automatically overide this display should the monitored values fall outside preset limits. The LED display is selected / cycled by pressing button B. The decimal point (as shown) can be configured to indicate that the unit is recording data (LITE Mini-Log Option and DD2-PRO ONLY). This can be turned on or off as desired. The engine revolutions per minute are indicated in 100 rpm increments. Once you have entered your gearbox ratios and set up the RPM and Speed inputs, the Digidash accurately calculates what gear you are in. Coolant Temperature Alarm - You can preset the temperature above which the Alarm will operate. The DigiDash 2 will monitor the engine coolant temperature and if this rises above your preset level, the CTA Alarm will be displayed. "Hard" Oil Pressure Alarm - The letters O.I.L. will be displayed if the mechanical switch on the oil pressure sensor (either ETB's sensor supplied with the package or the original engine oil pressure switch) is activated. The Alarm trigger point on the ETB sensor is fixed at 7.5psi or 0.5 BAR. "Soft" Oil Pressure Alarm - The DD2 range have a built-in oil pressure monitoring system. 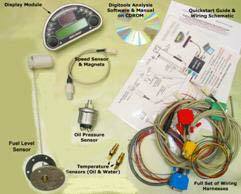 The user can preset the oil pressure level below which the OPA Alarm activates. In addition this can be combined with RPM values. OPA is displayed to distinguish it from a mechanical (Hard) activation. Oil Temperature Alarm - You can preset the temperature above which the Alarm will operate. The DigiDash 2 will monitor the engine oil temperature and if this rises above your preset level, the OTA Alarm will be displayed. Fuel Level Alarm - User pre-defined level of fuel remaining in the tank, below which the FLA Alarm will be displayed. The DD2 LITE enables you to program the shift-lights to match your vehicles engine. The RPM point at which the main RED LED illuminates can be specified, along with the shift-left delta. The shift light delta is the increments in RPM that each LED illuminates. For example you can program the LED's to illuminate in 100, 200 or 500 rpm steps. The system comes complete with the following sensors: hall-effect speed sensor; coolant temperature; oil temperature; oil pressure and fuel level (float-arm type). The LITE is very simple to install and comes complete with wiring harnesses that considerably reduce the number of connections usually required with stand-alone gauges. 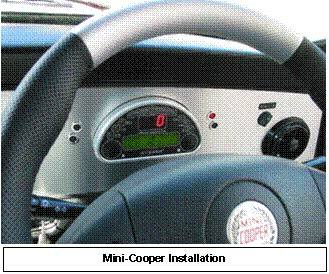 Configuration of the unit to match the vehicle can be done manually using the display or by programming the unit via the software supplied using a laptop computer. The wiring harness incorporates a serial port for programming and for those laptops with only USB ports available, a serial/USB adapter is included as standard. The DD2-Lite includes an engine hour counter which is very useful for planning service intervals and monitoring overall engine usage. 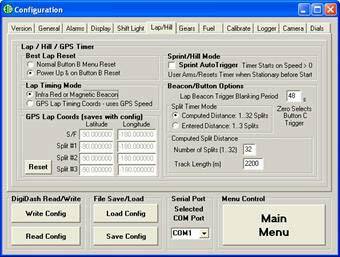 The acceleration / deceleration timer is programmable in that the start and stop speeds can be preset, thus allowing you to test the vehicle’s performance (such as 0-60 times or 30 to 50 times for example) before and after any engine or vehicle modifications. A trip distance counter is included that can be reset to record individual journey distances. This is coupled with a trip timer, which until manually reset records the total elapsed time of your journey and from these two parameters your average speed is displayed. Incorporated with the standard package is the mini-log data record feature. 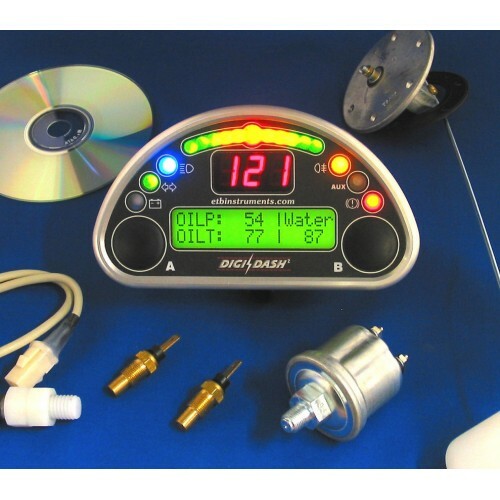 From a choice of four parameters, namely speed, rpm, distance or oil pressure, the DD2-Lite can record the last 10 minutes (approximate) of data on one channel. This can be then downloaded to a laptop computer for analysis using the software supplied. 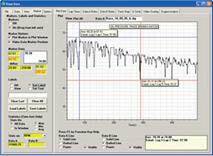 This is especially useful should you wish to check your oil pressure readings or analyse your speed trace over a set course. What's Included in the Standard DD2-Lite Package? For track day use, the unit can be factory upgraded to include a very accurate lap timing system complete with real-time performance indicator. An infra-red receiver is included that simply plugs into the main harness and can be used on race circuits that have an infra-red track beacon present. For those that don’t a low cost track side beacon is available as shown on the right. The lap number, total track time, last lap and best lap times are displayed along with up to 32 split times. A real-time split performance indicator shows your progress on the current lap and on completion of each lap, the lap time is displayed against your best lap. The picture on the left shows that the driver is currently on lap 5 and that the total elapsed race time is 3 minutes 50 seconds. It shows that in sector 3 (split), the time recorded was 0.17 seconds faster than the previous best. Similarly this image on the left shows the driver is now on lap 7 and that the total race time elapsed is 4 minutes 51 seconds. In the first sector the driver is 0.24 seconds slower than the previous lap – this is shown by the “+++”s in front of the time. Upon completion of the lap, the last lap time is automatically displayed for a user specified period. This period (in 1 second intervals) can be programmed using the software supplied. The left image shows that the last lap time recorded was 42.57 seconds, against the best lap time, recorded on lap 7, of 40.15 seconds. The number of sectors / splits is programmable using the DigiTools software. Sectors can be defined either manually by entering the distance in metres between each sector (1 to 3 sectors), or by simply selecting the desired number of sectors and total track length which the DD2 then divides up automatically into equal distances. Up to 85 laps can be stored for immediate post race / session recall and review. 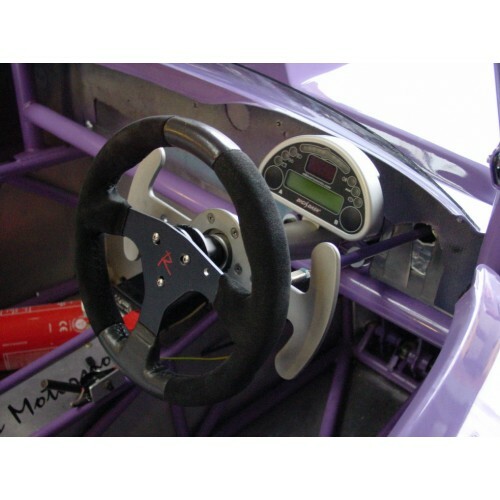 A manual button is also included that can be mounted on the steering wheel (the button plugs into the lap timer port) which enables you to manually time your laps should a beacon not be present on the day. The allows the timers to be used in the same way as you would use a stopwatch. With the number of traffic enforcement cameras increasing daily, the DD2-LITE can be factory upgraded to incorporate a GPS traffic camera warning system. 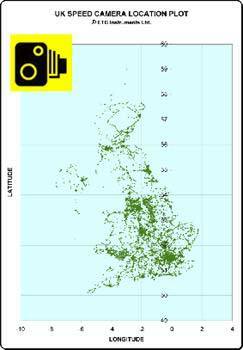 Pre-programmed with a database of over 10,000 GPS locations in the UK that can be kept regularly updated, the DD2-LITE warns you of proximity to a traffic enforcement camera. From your GPS location the LITE monitors the number of cameras in the area and will display a warning screen immediately once you are within a preset distance from it. This distance is user programmable from 200 metres to 999 metres. The speed camera type is depicted along with the speed limit of the location. Its proximity in metres indicates your distance to the camera. The camera database can be regularly updated by subscribing to thewww.PocketGPSWorld.com website for a minimal fee. The upgrade includes a 1Hz GPS Receiver which also provides a number of extra information screens. These include: heading; GPS Speed; altitude in metres; latitude and longitude. 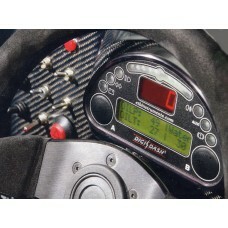 Upgrade option 2 also includes a lap timing system which uses preset GPS locations to indicate and store your lap times. A manual button harness is included with the upgrade package which can be used to store the Start / Finish line co-ordinates in latitude and longitude as well as 3 additional split time locations. The GPS locations are stored in memory so that they can be downloaded and saved for future use. In order to use the lap timer, all you do is drive round the circuit and press the button, firstly as you cross the start line and then at 3 other locations around the track wherever you require individual sector times. On your next lap of the circuit the timers will start. 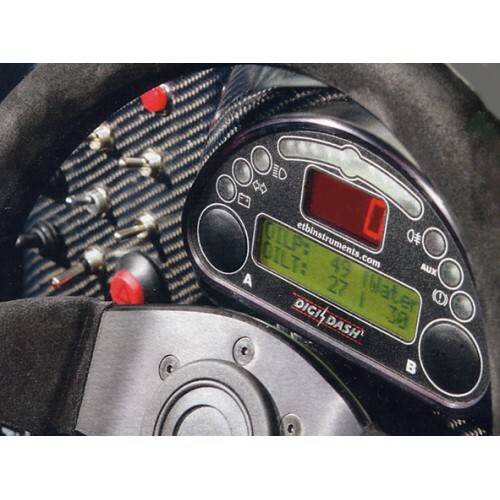 As with the infra-red timing system, last and best lap times are indicated along with total elapsed circuit time, lap number and a real-time split performance indicator. 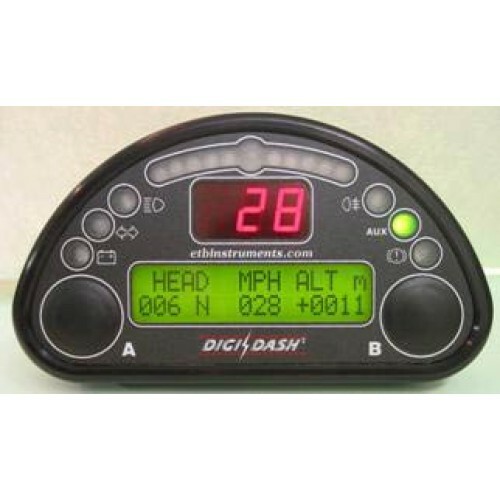 The DD2-LITE is a sophisticated all-in-one dashboard display that is easy to install and offers a far superior level of information over traditional gauges at a lower cost, particularly when you consider that all necessary sensors are included in the standard package. The DD2-LITE incorporates programmable shift lights and a gear indicator which are usually expensive add-on items and for a small additional cost the system can be upgraded to include a complete lap timing system either using infra-red or via GPS. The DD2-LITE is SVA (Single Vehicle Approval scheme) compliant and is suitable for all types of sports cars. With the added dimension of the GPS speed camera upgrade and with the number of traffic enforcement cameras being deployed ever increasing, the system becomes a complete and comprehensive package for the modern road user. Please go here for software and manuals. 1. Is the DD2-LITE IVA compliant. 2. Is the DD2 compatible with my ECU? A. The DD2 systems are stand-alone units supplied with their own set of engine sensors and hence are designed to be independent of the ECU, with the exception of RPM which can be taken from the ECU output. 3. Is there a connection for an alternator? No. The battery warning light on the DD2 is a 'low voltage battery alarm'. This can be programmed by the user to illuminate (in 0.1v intervals) when battery voltage drops below a user defined level. Depending on the type of alternator you have, it may need a traditional illuimation bulb or diode connected to the Charge-light connection in order for the allternator to excite and charge correctly.